You loved him in Shrek... now see where the one-and-only swashbuckling feline found his fame - and a very big pair of boots - in this “hilariously funny” (Associated Press) animated epic! Lover, fighter and outlaw Puss in Boots (Antonio Banderas) is off on the adventure of his nine lives as he teams up with Kitty Softpaws (Salma Hayek) and Humpty Dumpty (Zach Galifianakis) for the ultimate showdown with the notorious Jack and Jill (Bil..
Own Shrek 1 to 4 Blu-Ray from Deff, DVD, Blu-Ray & 4K Video Specialists - Free UK Delivery..
Get ready for Thirds - the greatest fairy tale never told continues with a whole new hilarious comedy of royal proportions. When his frog-in-law suddenly croaks, Shrek embarks on another whirlwind adventure with Donkey and Puss In Boots to find the rightful heir to the throne. Everyone's favourite cast of characters is back, along with a magical misguided Merlin, an awkward Arthur, a powerful posse of princesses, and a bundle of unexp..
Get ready for Thirds in this hilarious comedy of royal proportions. When his frog-in-law suddenly croaks, Shrek embarks on another whirlwind adventure with Donkey and Puss In Boots to find the rightful heir to the throne. Everyone's favourite cast of characters is back, along with a magical misguided Merlin, an awkward Arthur, a powerful posse of princesses, and a bundle of unexpected arrivals. Only Shrek can tell a tale where everyo..
Get ready for Thirds – the greatest fairytale never told continues with a whole new hilarous comedy of royal proportions. When his frog-in-law suddenly croaks, Shrek embarks on another whirlwind adventure with Donkey and Puss In Boots to find the rightful heir to the throne. Everyone's favourite cast of characters is back along with a magical misguided Merlin, an awkward Arthur, a powerful posse of princesses, and a bundle of unexpected.. It started with a loveable ogre... who befriended a talking donkey... and recued a beautiful princess in the unforgettable story that broke the mould for all animated films to follow. Now comes Shrek Forever After, the hilarious and fitting finale to this record-breaking, Oscar-winning* movie phenomenon. Longing for the days when he was a "real ogre", Shrek signs a deal with Rumpelstiltskin to get his roar back... but turns his world ..
You've never met a hero quite like Shrek, winner of the first Academy Award for best animated feature*. The endearing ogre sparked a motion picture phenomenon and captured the world's imagination with... the greatest fairy tale never told! Critics are calling Shrek "not just a brilliant animated feature, but a superb film on any level" (Larry King, USA Today). 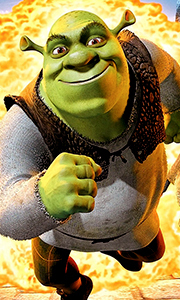 Relive every moment of Shrek's (Mike Myers) daring quest to rescue the fei..
Own Puss In Boots DVD from Deff, DVD, Blu-Ray & 4K Video Specialists - Free UK Delivery..
Own Shrek - Shrek & Donkey Mug from Deff, DVD, Blu-Ray & 4K Video Specialists - Free UK Delivery..
Own Shrek / Shrek 2 / Shrek The Third / Shrek Forever After DVD from Deff, DVD, Blu-Ray & 4K Video Specialists - Free UK Delivery..
Everyone's favourite larger-than-life hero returns in Shrek 2, the #1 animated film of all time hailed by critics and audiences alike as even better than its Oscar-winning predecessor! The Mail On Sunday proclaims Shrek 2 to be "another monster hit from the ogre." Happily ever after never seemed so far far away when a trip to meet the in-laws turns into another hilariously twisted adventure for Shrek and Fiona. With the help of his fait..
Own Shrek 2 DVD from Deff, DVD, Blu-Ray & 4K Video Specialists - Free UK Delivery..
Own Shrek The Third DVD from Deff, DVD, Blu-Ray & 4K Video Specialists - Free UK Delivery..
Own Shrek Forever After DVD from Deff, DVD, Blu-Ray & 4K Video Specialists - Free UK Delivery..
Own Shrek DVD from Deff, DVD, Blu-Ray & 4K Video Specialists - Free UK Delivery..
Own Shrek The Musical DVD from Deff, DVD, Blu-Ray & 4K Video Specialists - Free UK Delivery..